Well I'm back online at last. Going to take a little while yet to get this new computer set up and for me to learn the new OS, but regular posting should resume soon. 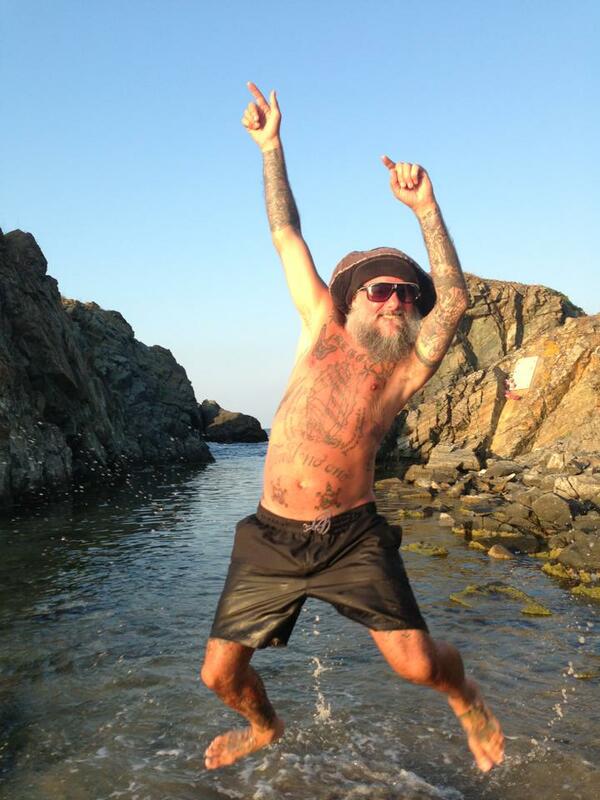 So to start us off, this is my former neighbor Geoff Lagadec of Jaya the Cat at Sozopol Beach, Bulgaria. He lived upstairs from me for a few years while I was in lovely downtown Northampton. The band used to practice at all hours of the day and night. They weren't that great when they started out but apparently they improved over the years. They moved to Amsterdam and became a very successful group. They tour all over Europe all the time. And yes, they were named after their actual pet cat. She was a beauty. Addendum: Just remembered I was there when he got the first cuff on his upper arm. It was somewhat gruesome. He just looks like a fun type of guy.........! There were nice kids. When he was my neighbor he was very young and clean shaven. But he always had long dreads. So weird to see him now with that grey beard.